It sounds a little complicated, but it’s quite an easy concept to understand. There are many times when a primary (baby) tooth can’t be saved. The reason being is that the tooth may have a very large cavity or perhaps it has become infected. In any case, at times primary teeth need to be removed. Depending on the child’s age, it may be necessary to put in a ‘spacer’ to maintain the gap/space until the permanent or adult tooth is ready to come in. If your child is in the twelve year old age range, we don’t usually need to place a space maintainer, because the adult tooth is probably well on its way to erupting into the mouth and filling the space. But, if your child is younger, say six years old and the primary tooth has been removed, we usually need to fill in the gap to preserve the space for the adult tooth until it is ready to erupt. Reviewing an earlier blog, “What happens when a tooth is removed“, may help you to understand why we need to replace the primary tooth with a space maintainer. Re-Cap: If a tooth is removed, whether it is a primary or adult one, the teeth around it tend to shift or move into the space. If the original gap becomes smaller or narrower, then the adult tooth, which is still under the gums, won’t have room to come in when it is ready to. Please see the image from the blog “Anatomy of your Child’s Jaw,” posted on November 18, 2012. In order to deal with the missing tooth and preserve the space for the adult tooth that is under the gums, we make a space maintainer. This is a simple procedure. We take an impression, or mould of the ‘area’ where the tooth was removed; send it to the lab and they make the space maintainer. It is basically a brace (or a band) that is cemented onto one of the teeth on either side of the gap, with a wire loop that ‘encroaches’ upon the tooth on the other side of the gap (see image above)…it holds the space. 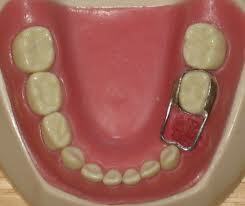 Your child should avoid sticky foods such as gum or toffee that may pull the space maintainer off. When you think about it, they should avoid this type of food in any case. In addition, it’s very important to keep the area around the space maintainer clean. If plaque adheres to the ‘band’ on the tooth, then the enamel underneath the band can start to decay. We keep the space maintainer cemented in the mouth until the adult tooth starts to peep (erupt) through the gums. At this point, we remove it, as it has done its job…mission accomplished! Get to know Dr. Axelrad and make your child’s dental visit a positive experience. Call us today at (905) 791-3867 or visit us at Bestgate Professional Center, 40 Finchgate Boulevard, Suite 121, Brampton, Ontario. New patients, walk-ins and Emergencies are welcome.